Botulinum Neurotoxin and Tetanus Toxin covers the mechanism of action, pathogenesis, and treatment of clostridial neurotoxins. The book is organized into four parts encompassing 18 chapters that discuss the origin, structure, pharmacology, toxicology, immunology, assays, and clinical issues of botulinum and tetanus neurotoxins. The introductory part of the book discusses the discovery and production of neurotoxins in various strains of Clostridium bacteria. This text also describes how specific bacteriophages and plasmids mediate the pathogenicity of some types of Clostridium botulinum and Clostridium tetani. 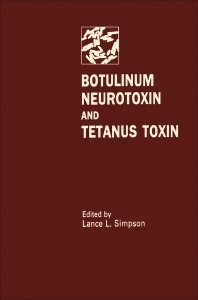 The subsequent part provides an overview of issues related to toxin binding, including toxins that may serve as models for botulinum and tetanus neurotoxins. Discussions on the peripheral and central aspects of poisoning transport in the central nervous system and on the antagonistic drugs for clostridial neurotoxins are provided. The third part of the book addresses the antibodies against botulinum neurotoxin. Bioassay in mice and highly sensitive immunoassays, such as reversed passive hemagglutination, reversed passive latex agglutination, radioimmunoassay, and enzyme-linked immunosorbent assay, are presented. The concluding part covers the animal models for these toxins and discusses the diagnosis and treatment of botulism and tetanus in human. The clinical use of Clostridium botulinum toxin type A in ocular and neuromuscular disease is also examined. This book will be of value to protein chemists, microbiologists, virologists, pharmacologists, immunologists, and clinicians.